The Grey city of Dorminia, surrounded by granite walls thrice the height of a man and at least three feet thick at it's weakest point. These walls provide a barrier for those without as they do those within, patrolled by the harsh Crimson watch and observed from the skies by the Mindhawks - magical tools of a paranoid ruler that sniff out dissent from a persons very thoughts. Ruled with an iron-fist and savage tyranny, there are still signs of hope with small pockets of resistance hiding in the shadows and spreading disaccord where they can. When two formidable Highlanders save the life of a young rebel, it provides the foundation for an unlikely fellowship. A fellowship united against tyranny, but composed of self-righteous outlaws, crippled turncoats and amoral mercenaries. A grim company. But with the world entering an Age of Ruin, this is not a time of heroes. The Grim Company has it's own particular style, a strong and confident voice projected by the author that is different to anything else in the genre. It's got gritty elements and unlikely heroes that frequent much of 21st century fantasy but the author also manages to capture elements of the more classic 20th century stories - powerful magicians and heroic deeds included. This is a world that is fought over by almost immortal and god-like tyrants who have shed much of humanity in their lust for power. This is a world where there is no real good or evil; just different shades of grey, underscored by the authors lucid, dynamic prose. The world building has an air of grandeur about it, telling the tale of Gods cast down and destroyed by mortal sorcerers amidst a cataclysmic event that has altered the world and it's inhabitants lives forever. Speaking of the inhabitants, there is a great diversity both in the general populace and the characters that make up the story. Those include an aging barbarian hero and a crippled wizard who was kept alive when all other wizards within the city of Dorminia were executed by Magelord Salazar - purely due to his weakness in the magic arts. Each of these characters are ever so colourful and extrude a kind of realism that helps the reader to route for them. The story itself is inventive and fast paced with little real let up, no mean feat considering the world-building that goes on and it is one of those nail-biting tales that are pretty much mesmerizing. There is much talk about this novel being the fantasy hit of the year, it was originally "won" by the new publishers Head of Zeus at auction I can understand why they fought to win it - I would have done the same. I would never have guessed that this was a debut novel, it's got the feeling of a writer at the very top of his game, one that had been writing for years. The book manages to blend in all the things that make a good fantasy shine and it's easily on a par with any fantasy book I've read in the last year or two. Even thought it is the start of a series the novel also feels quite contained and stands up well on it's own, another credit to the author. Highly memorable with a great cast and an even greater story all wrapped up in a mature world, told by a true story-teller. 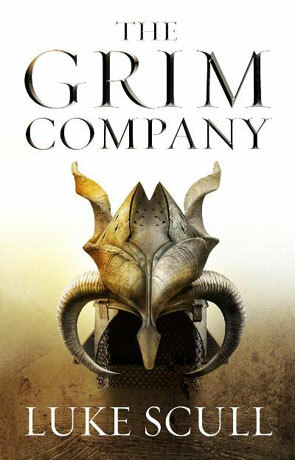 The Grim Company IS one of the best fantasy books you will read this year. Written on 27th February 2013 by Ant.